You know the talk about the MERS virus spreading in Korea recently? Well, the virus reached the town where I live. I… might be a little scared. Oh yeah, the math test went really well today. Considering how little I studied, I did pretty damn well. Oh, almost forgot. I decided that I’d take on a side project at about chapter 10 or so. What do you think I should take? The first thing Cho Ryu Hyang heard when he woke up distressed him. Cho Ryu Hyang felt that there was another meaning to Peng Ga Ho’s statement by instinct. Sure enough, Peng Ga Ho immediately spoke with an annoyed tone. Peng Ga Ho was angry. He knew Cho Ryu Hyang got first place in the competition with pure skill. Would one not be angry if someone accused him/her of cheating, when he/she accomplished something with their own power? Because of that, Peng Ga Ho was furious at that moment. Cho Ryu Hyang was unexpectedly calm. No, he looked like he didn’t even care about it. It wasn’t time to be concerned about such petty things. He was more concerned with the strange things that were floating in front of him. Because Cho Ryu Hyang was unable to take his eyes off these objects, he looked like he was in a dazed state to Peng Ga Ho when he talked. Cho Ryu Hyang wasn’t being angry because there was no point in being that way. He disliked doing fruitless activities like such. Peng Ga Ho smashed his chest with his fist in anger. Peng Ga Ho admitted that Cho Ryu Hyang was indeed a genius. He also knew that this genius always worked ceaselessly. That made him even angrier. The current situation where no one even recognized the amount of time Cho Ryu Hyang put into study, but even dared to look down upon it, made Peng Ga Ho furious. Peng Ga Ho put his hand on Cho Ryu Hyang’s shoulder, and spoke seriously. He knew why Peng Ga Ho was being so angry. And even if he didn’t say it, it was his every intention to rub his skill in their faces. Cho Ryu Hyang, too, was bothered by the actions of the school, after all. Right now, his physical condition wasn’t what was important. The strange things that he was seeing from before. It was bothering him to no end. It was numbers. There were numbers floating in the air everywhere. Cho Ryu Hyang was thankful towards Peng Ga Ho for rushing to him right from school after receiving word of his recovery, but right now, he wanted to be alone. There were too many things to think about right now. Compared to the things he had in mind, the test was a small matter. It didn’t matter if he had to retake the test several times. The importance of figuring out what these numbers were was far more important. Peng Ga Ho, who was unable to vent all his anger, went out while complaining by himself. Watching that, Cho Ryu Hyang closed his eyes. He called upon the old man in his mind. He couldn’t decide on what to call the old man, as he still was unable to decide if the old man really was Zhuge Liang. The old man appeared in his thoughts, and stared at him with a face of contempt. Cho Ryu Hyang, looking at the old man, asked a question. The numbers were everywhere, and they were constantly changing. Cho Ryu Hyang’s curiosity sparked just then. He opened his eyes a little, and tried to touch the number near him with his hands. Then the colorless number took on a lifelike color. The number immediately became colorless again. Cho Ryu Hyang closed his eyes in confusion. The old man clicked his tongue, looking at the agitated boy. Looking at the numbers, no, to be specific, the old man taught Cho Ryu Hyang the way to be able to be able to correctly look at the origins of the world. This was the first skill Cho Ryu Hyang inherited from the old man. It was good to have the test done in public. Make the questions on the spot, and make him solve it on the spot. There were no possibilities of cheating. This was a bit troubling. The child just solved all the problems with ease. There were not even the slightest bit of hesitation in his writings. Was his name Cho Ryu Hyang? He was only 11. Eu Hyun Guk couldn’t understand why the child stubbornly stuck to mathematics with that kind of talent. While he did look down on math, he did not look down on its difficulty. But in daily life, wasn’t it enough to just be able to calculate living expenses? He didn’t know why one had to memorize all these complicated equations and such. Mathematicians devoted their lives on a pointless subject and wasted their time away. This was what most of the population thought, and this was why many looked down on math. Jo Gi Chun took up Cho Ryu Hyang’s answer sheet with his, and showed it to the teachers. Their answer sheets matched perfectly. All the students that were watching nodded their heads in shock. It seemed that everyone except Cho Ryu Hyang and his acquaintances doubted his skills. In all honesty, how could they believe it? The answers were answers, but at that solving speed? When Jo Gi Chun said this, Eu Hyun Guk nodded with a unsatisfied expression. He turned to Cho Ryu Hyang after doing so. Cho Ryu Hyang had a dumb expression on his face for a while, but he immediately recomposed himself, and glanced at Jo Gi Chun. However, Jo Gi Chun’s face did not change one bit. From the start, he wasn’t one to display his emotions outright. But Cho Ryu Hyang was furious. He didn’t know why, but he was just furious. Cho Ryu Hyang put on his calm face, and opened his mouth. Eu Hyun Guk’s face turned ugly. Eu Hyun Guk sighed in sorrow. To think there was a genius like Nangong Yubin! He wished to take the boy and teach him everything he knew. But since the boy himself said that he didn’t want it, he couldn’t even say anything. Indeed, one could take his cattle to a river, but it wasn’t possible to force the cattle to drink. Cho Ryu Hyang bowed a little towards Eu Hyun Guk. He really disliked this man. At a public area, in front of so many students, how could he insult a fellow teacher like that? To think even a scholar like Eu Hyun Guk would act like this towards it. Cho Ryu Hyang smiled a bitter smile. And he looked at Eu Hyun Guk’s forehead at a glance. A faint number was stuck onto Eu Hyun Guk’s forehead. Cho Ryu Hyang whispered to himself. Jo Gi Chun, who was standing next to Cho Ryu Hyang, heard what he said, but since he didn’t realize the significance of Cho Ryu Hyang’s words, didn’t do anything. He later opened his mouth while looking at Cho Ryu Hyang. It was indeed troublesome, but it was worth it. There was no one who would doubt his mathematical skills now. Life would be a little more comfortable now. Cho Ryu Hyang took a step back, and took a breather. He inhaled slowly for a long time, and exhaled fast, and rapidly. Then he took a look at all the teacher’s faces. And lastly, he looked upon Jo Gi Chun and smiled a bit. He turned back, and walked away. A lone crane was bound to be bullied in a flock of crows. The numbers that portrayed the worth of a human being. Cho Ryu Hyang respected Jo Gi Chun even before he gained his powers. At first, Cho Ryu Hyang only respected him because of his title, but now, he respected the man’s whole self. The man’s passion for math didn’t decline even as he aged. He even went through all this torture just to pass on his art to his students. The fact that he was able to take on all the insults regarding math, and taught the students who didn’t know math well, was naturally admirable. He didn’t know about other subjects, but regarding math, it became more and more profound as one got deeper into it. And Cho Ryu Hyang believed that his knowledge regarding math became more profound. The knowledge the strange old man gave him truly did help him learn math faster, after all. While Cho Ryu Hyang was thinking about this and that while he walked towards the dorm, Jo Gi Chun approached him from behind. Jo Gi Chun nodded, and left to do his own thing. Looking at that figure, Cho Ryu Hyang thought a bit. Perhaps the teacher had a better view of him thanks to today’s events. Cho Ryu Hyang always had to suffer through punishments during lectures because of Peng Ga Ho. It might be just his imagination, but he thought he saw a hint of benevolence in teacher’s eyes. As he shook off that thought and walked out, he encountered someone waiting for him at the doorway. It was someone he didn’t expect to see at all. Cho Ryu Hyang looked at the person in front of him, with suspicion in his eyes. He was the child of the famous Nangong clan, and was called the greatest genius in the history of the school. To think this child, who he never exchanged words with, would congratulate him. Cho Ryu Hyang didn’t know how to respond to that. And when he focused on his eyes and used his skill out of curiosity, he was genuinely shocked. It was an astronomical number. Most people had a value of 20-30… Nangong Yubin possessed a value about 3 times as much as other people did. He didn’t know how that number got there, but if one was to simply look at it, Nangong Yubin had a talent that outstripped even Jo Gi Chun. Perhaps there really were geniuses in the world. He was doing pointless things, Cho Ryu Hyang thought. Cho Ryu Hyang didn’t know how to respond to such an action, so he just looked at Nangong Yubin with a slightly anxious face. It seemed that his action brought great distress to the boy, so he panicked a little and spoke. Now Cho Ryu Hyang realized why this fellow waited for him here. And he was shocked once again. Were all children in famous clans like this? It was an apology that didn’t even need to happen. The boy also knew that, but he came to apologize anyway. There was no reason to reject it. It wasn’t anything troublesome to him anyway. But it seemed Nangong Yubin didn’t think that way. His face turned into that of relief the moment he heard Cho Ryu Hyang’s reply. A face that implied he just got a load off his back. Cho Ryu Hyang was confused about what relieved him. Nangong Yubin had a grin on his face as he said that. 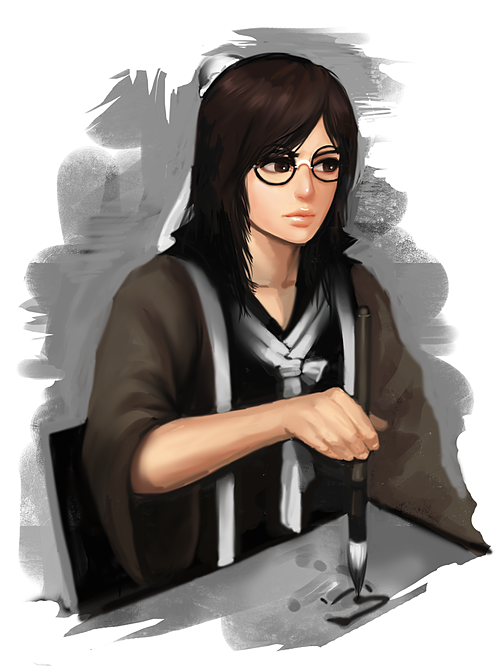 Cho Ryu Hyang fixed his glasses with an embarrassed expression. He was being called a genius by a genius like Nangong Yubin. It made him feel a little awkward. Cho Ryu Hyang suddenly felt uncomfortable. The fact that the boy was approaching him all of the sudden like this weirded him out a little. Nangong Yubin smiled, showing his white teeth in the process. Nangong Yubin disappeared after saying everything. Cho Ryu Hyang watched the boy walk away in a daze for a while, then fixed his glasses, while uttering a few words under his breath. He was a boy that Cho Ryu Hyang couldn’t understand. Cho Ryu Hyang walked slowly. His legs naturally drew him to the library. The guard at the entrance of the library asked Cho Ryu Hyang worriedly. Cho Ryu Hyang didn’t know if this was a banter or not, but he just said that he was alright, and entered the library building. And he looked for a certain book for a long time. The thing that was weighing on his mind for a while. He needed to confirm it. The item he was looking for was found faster than he expected. That was because he could see the book where it was put last time. As he pulled out the book, he could clearly see the name written on it. He didn’t realize last time, but it seemed that there were two volumes to this book. He opened the book carefully. And his eyes widened in surprise. The contents of the book were wiped clean. No, to be more accurate, everything within the book, every single word, was gone. It was as if someone just forcefully dragged out all the characters in the book and threw it away. Even now, if he thought of something, he could feel the immense amount of knowledge swimming through his brain. His brain was filled with decades of research at once. But it was a useless thing. To make the knowledge actually something that he could comprehend and use, it required a tremendous amount of work. While he was thinking, he suddenly came up with a question, and shut his eyes immediately. Cho Ryu Hyang felt that he knew the answer even before he asked the answer. It was actually a question he should’ve asked a long time back, but he just remembered to ask it now. Was there something about his question he didn’t know about? It was a riddle-like phrase. The old man spoke again a little after he said that. Cho Ryu Hyang contemplated upon that a bit. Truly, an existence like him was rare. But he also felt that there were indeed more like him in the world. There were many people like Jo Gi Chun, who dedicated their life to math, after all. The old man affirmed his thoughts cooly. The old man stopped there for a moment, and made a bitter smile. And he changed the subject a little. Cho Ryu Hyang scratched his head and smiled. It seemed that the old man felt the same way he did. The art of math was being neglected too much, past or the present. It was something he was able to experience firsthand today. When Cho Ryu Hyang became curious, the old man answered immediately. Cho Ryu Hyang was finally able to understand what the old man was talking about. An idiot’s language for the idiots. It seemed this was why he wrote the first book with numbers, and the second book with letters. A way to preserve his knowledge, even a little. It was an evil smile that didn’t really fit the image of the old man. Cho Ryu Hyang blinked a few times. He didn’t understand what the old man was talking about. Cho Ryu Hyang didn’t realize. Right then, his head spun and his body lost all the strength it had before. Cho Ryu Hyang opened his eyes quickly, and leaned his body against the library wall to regain his breath. Talking with the old man took up too much power. It wasn’t easy to handle it yet. Whilst recovering his body from the talk, Cho Ryu Hyang looked around the library. There were still many books to be read, but that was useless to him now. It wasn’t like those books would help him increase his powers, anyway. It might’ve seemed like a boast to others, but Cho Ryu Hyang already had more than enough knowledge about math. Perhaps too much. It seemed that missing something wasn’t just some simple knowledge. He didn’t know what it was, but he had an endless desire to learn that something. After thinking by himself a little more, Cho Ryu Hyang put the book back into the shelf and stood up. He forgot about the promise to visit the teacher. He decided to go resolve it now. Little did he know that that event would change the course of his life greatly. Found it really hilarious that so many people voted nothing :).